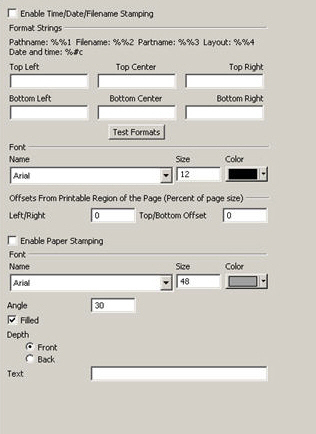 The Stamping settings can be used to automate the inclusion of information about your .ckd files in prints. The specific information to be included on your printouts is configured in the Format Strings section at the top of the dialog. To include one of the supported format strings, enter the code in one of the available input fields. Date and Time - %#c. See below. The input fields represent a specific location on your print-out. For example, if you type %#c in the "Bottom Right" input field, the current date and time will appear in the lower right corner of your print-out. You can also choose a Font Name, Size, and Color, as well as specify Offset values. The offset value, expressed as a percent of the total page size, will shift the text in the specified direction(s). Left/Right offset will move the text on the left and right towards the center by 10% of the page width. Top/Bottom offset does the same with the page height. Use the Test Formats button to preview your settings as they apply to the currently loaded design file. Note that a result will only be displayed if there is relevant data (e.g., the Filename code result will only display if the current file has been named and saved).